In Mexico is very common to find the famous “Fresh Waters". And what is that, you possibly wonder? Very easy, they are simple and refreshing beverages prepared from fruits, seeds, herbs, etc. But the best is that they are the perfect drink for those hot days and they are also very nutritious and healthy. As it can be imagined the cantaloupe water is a drink that is super fresh, sweet and very appetizing at any moment. This water is excellent to enjoy it while appetizers or snacks are eaten. Although it can also be served to accompany and Mexican main course. *In Mexico the fresh waters are sold at restaurants, fondas, markets and even on street stalls. Be careful if you are going to buy a fresh water at a stall because they tend not to meet with the minimum hygienic standards. This recipe is super easy to make, perfect for beginners. The cantaloupe that is used in this recipe is the orange also known as Chinese cantaloupe – don’t use the green cantaloupe. This water is sweetened with white sugar however also brown sugar could be used because it is easier to process. The only difference is that the water will have a darker color. The preparation time is of 5 minutes . This recipe yields 2 qts. Remove the skin and the seeds of 1/2 cantaloupe. Dice the pulp of the 1/2 cantaloupe with the one you worked and put it in a blender. Strain over a pitcher the cantaloupe water and if you want add ice cubes to taste. If you want the cantaloupe water can be served without straining it, it will have more textures and it will be interesting. Variation: Now try a fresh water with spiced flavor with the horchata water. Did you like the Cantaloupe Water? Buy a big, sweet, juicy and fresh cantaloupe like this one. 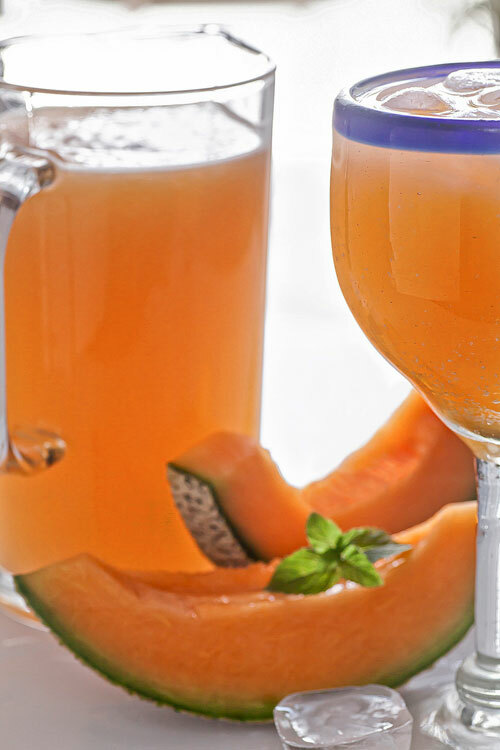 Present this cantaloupe water in a Mexican pitcher – it will look great. This wooden spoon is perfect to stir the cantaloupe water because it is large and resistant.